In this rank he fought at the first battle of Bull Run, and subsequently at the head of a division in the Peninsular campaign and the Seven Days. This division subsequently became the nucleus of the 1st corps, Army of Northern Virginia, which was commanded throughout the war by Longstreet. This corps took part in the battles of second Bull Run and Antietam, and held the left of Robert E. Lee's front at Fredericksburg. Most of the corps was absent in North Carolina when the battle of Chancellorsville took place, but Longstreet, now a lieutenant-general, returned to Lee in time to take part in the campaign of Gettysburg. At that battle he disapproved of the attack because of the exceptionally strong position of the Federals. He has been charged with tardiness in getting into the action, but his delay was in part authorized by Lee to await an absent brigade, and in part was the result of instructions to conceal his movements, which caused circuitous marching. The most conspicuous fighting in the battle was conducted by Longstreet. In September 1863 he took his corps to the west and bore a conspicuous part in the great battle of Chickamauga. In November he commanded the unsuccessful expedition against Knoxville. In 1864 he rejoined Lee's army in Virginia, and on the 6th of May arrived upon the field of the Wilderness as the Confederate right had been turned and routed. His attack was a model of impetuosity and skill, and drove the enemy back until their entire force upon that flank was in confusion. At this critical moment, as Longstreet in person, at the head of fresh troops, was pushing the attack in the forest, he was fired upon by mistake by his own men and desperately wounded. This mischance stayed the Confederate assault for two hours, and enabled the enemy to provide effective means to meet it. In October 1864 he resumed command of his corps, which he retained until the surrender, although paralyzed in his right arm. 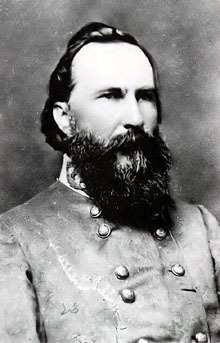 During the period of Reconstruction Longstreet's attitude towards the political problem, and the discussion of certain military incidents, notably the responsibility for the Gettysburg failure, brought the general into extreme unpopularity, and in the course of a controversy, which lasted for many years, much was said and written by both sides which could be condoned only by irritation. His acceptance of a Federal office at New Orleans brought him, in a riot, into armed conflict with his old Confederate soldiers. His admiration for General Ulysses S. Grant and his loyalty to the Republican party accentuated the ill-feeling of the Southern people. But in time his services in former days were recalled, and he became once more "General Lee's war-horse" to his old soldiers and the people of the South. He held several civil offices, among them being that of minister to Turkey under Grant and that of commissioner of Pacific railways under Presidents William McKinley and Theodore Roosevelt. In 1896 he published From Manassas to Appomattox, and in his later years he prepared an account of Gettysburg, which was published soon after his death, with notes and reminiscences of his whole military career.